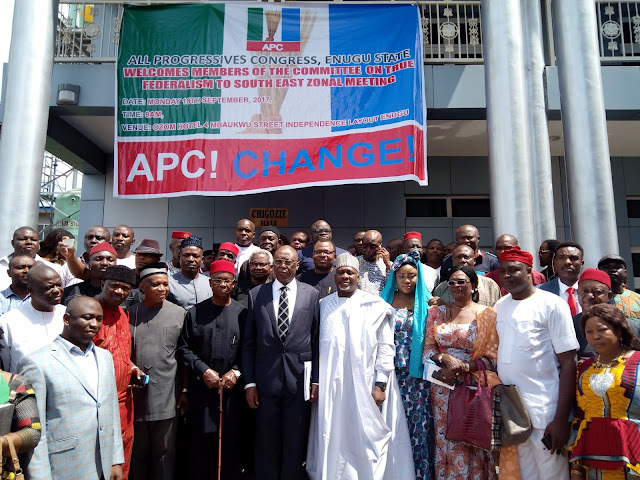 Following increased agitations in the South, the All Progressives Congress( APC) on Monday commenced consultations on restructuring as a means of addressing the challenges facing the country. Speaking during the APC committee on True Federalism public consultation which held in Enugu, the Director General, Voice of Nigeria and spokesperson of the party in Enugu, Mr. Osita Okechukwu said that the mandate of the committee is to interface and engage with members of the party and the general public on issues of great importance. According to him, article 7 of the party constitution commits her to promote and foster the unity, political stability and national consciousness of the people of Nigeria. He noted that the creation of a true federalism with more equittable distribution of national revenue to the states and local government will ensure grassroots democracy and economic development. "We must bring the government closer to the people through political decentralization and local policing" he said. Some of the issues that were raised during the consultation include: The creation of states in the South, fiscal federalim and revenue allocation, independent candidacy which will provide eligible citizens to contest elections without being member of registered parties. Other issues raised were: Land tenure system, local government autonomy, power sharing and rotation, resource control and type of legislature. It was agreed at the consultation that the office of the president should be rotated between the north and the south taking into cognizanse the 6 geo- political zones in the country. Also speaking at the consultation, Kogi State Governor, Yahaya Belo said that APC is determined to ensure that the country stays together by addressing the issues that have continued to threaten her existence. "The political system is dynamic and so, we will not get tired of discussing issues that affect our existence as a nation" he said. On her part, the publicity secretary of APC in Enugu state, Kate Offor said that the restructure must focus on revamping the railway system and creating employment opportunities for the younger generation. Oke Eziah, a former gubernatorial aspirant in Enugu State underscored the need to make the restructuring move a serious issue by giving it enough Publicity. The committee for Enugu is led by Kofi state Governor, Yahaya Bello, Former Governor of Ekiti, Professor Oserheimen Osunbo and Ondo State Governor, Rotimi Akeredolu.